New Zealander George Bennett will make a permanent step up to the professional ranks next year after riding with Team RadioShack as a stagiaire since August. The 21 year old was offered the job by Johan Bruyneel and his management team after a fine performance during his apprenticeship, and is set to become team-mates to riders such as Andy and Frank Schleck and Fabian Cancellara. 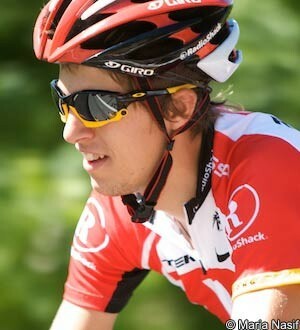 Bennett was a member of Trek Livestrong this season, a feeder team for RadioShack. After winning the Tour of Wellington at the beginning of the year and racking up a number of podium places in France, he was invited to ride for RadioShack from August. His role was to ride in support of Levi Leipheimer at the Tour of Utah and USA Pro Cycling Challenge, two races the American ended up winning. The Kiwi is following closely in the footsteps of compatriot Jesse Sergent who also graduated from Trek Livestrong to make a successful senior debut for RadioShack. Sergent won Driedaagse van West-Vlaanderen and Tour du Poitou Charentes this year, and although Bennett is unsure of how close he’ll come to winning races in his first year, watching successful neo pros like Sergent and Alex Dowsett brings him some encouragement. “I can only assume as a young guy in a team with such an impressive roster I will be there to learn, develop and help the team mostly in the mountains,” Bennett said. “I think watching how [Sergent and Dowsett] have made the jump and the experience I got from my time as a stagiaire I have a good idea of just how fast the WorldTour will be.